Stores reference 6D/645. Size medium. 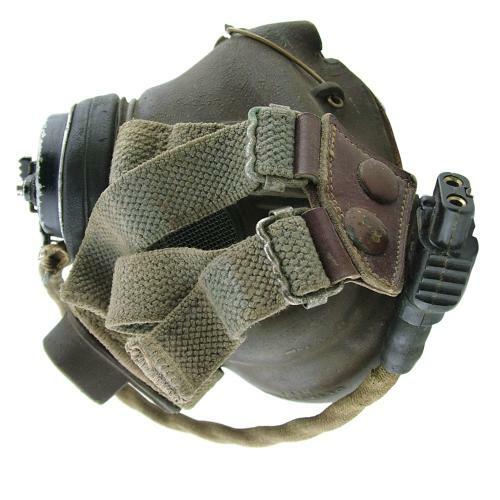 The facepiece retains good overall shape and is quite flexible. It is soiled but largely free of damage bar relatively minor crazing and cracks, mainly towards the edges and around the inspiratory valve in the cheek. The nosewire is in place although the central retaining lug has split. Remember that large sized close up photos make all this look worse than it really is. The webbing harness retains reasonably good colour but is stretched and lacks elasticity. The harness retaining wire is absent. Lined in brown suede which is a little soiled but undamaged. The mask is fitted with a decent type 48 microphone assembly. A reasonably good used example suitable for display. Stock code O23017.